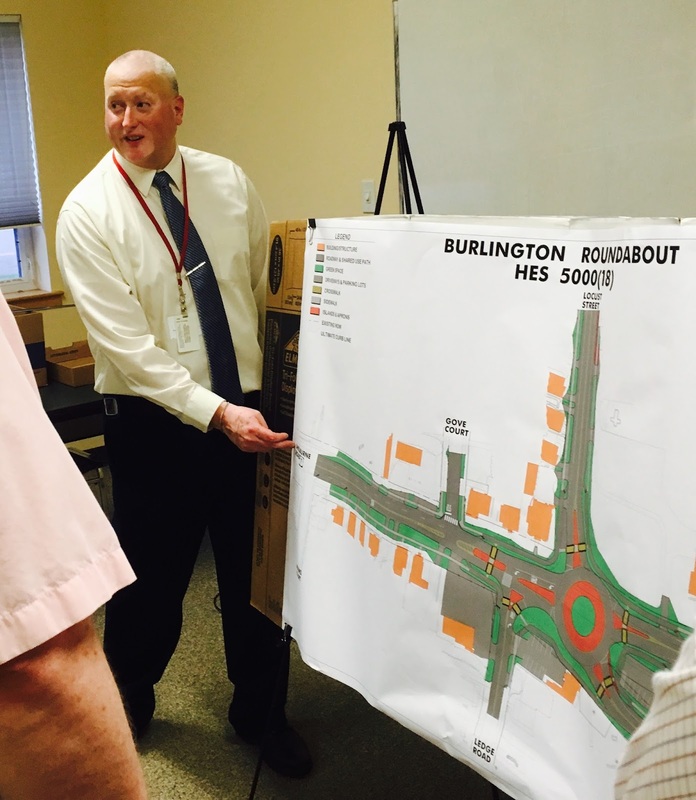 BURLINGTON, VT—June 30, 2016 The Vermont Agency of Transportation (AOT) project manager calls the Shelburne Street roundabout project the most difficult in his 17 year career because of the “spaghetti” of utilities underground. Engineer Michael LaCroix, P.E. gave a “very likely“ roundabout installation for 2020 at the high accident list intersection where two pedestrian injuries were recorded during 2011-2014. when it rated within the 17 highest pedestrian crash locations in Burlington. LaCroix said he checked the crash performance of the three Route 15 Lamoille County roundabouts (Cambridge, Hyde Park, and Morrissville) and found a 50% reduction in crashes. He pointed out that because of the lower speeds at a roundabout that crashes which do occur are less severe on average than those at signs or signals. The project construction takes two years with the “hoped for” start in 2019 devoted to the utilities work and 2020 the actual construction of the roundabout. About 20 residents and Department of Public Works (DPW) staff attend the June 29 meeting where LaCroix agreed to periodic updates at the request of City Councilor Karen Paul who explained that the project which goes back to 2008 has been very difficult to get information about since. In the most recent AOT report the intersection recorded 50 crashes over five years. LaCroix stressed the project is a collaborative one with DPW where Laura Wheelock is project manager. LaCroix's unit is doing the design work. He said the project is an “absolute” priority and continues as first or second among the dozen projects assigned to his unit. LaCroix who meets with DPW every three months saw no reason that updates on project status can be done regularly. LaCroix said once the utilities plans are worked out with each utility expected over the next months the regular steps of acquisition of right-of-way occurs in 2017 and 2018 along with final design elements take place. Travel time may be somewhat longer for those traveling St. Paul/Shelburne Streets but less for those entering from the other three streets, Locust, Ledge and South Willard. About half the cost of the $2-$4 million project involves underground utilities work. Utilities include water, electric, at least two cable lines, and Vermont Gas—all with various connections and locations at the intersection involving five streets. Added to this work are what might be termed pockets to take storm water runoff and treat if before joining a pipe which directly enters Lake Champlain. Coalition Re-design Cuts Parkway Construction Costs $11.6 million--NEW REDESIGN MAP!! A preliminary estimate of construction cost savings from the Pine Street Coalition (PSC) Re-design Guidelines stands at $11.6 million. The $11.6 million reduction is a third of the current construction cost estimate by Vermont of $33 million and a quarter of the total project cost estimates of $44.3 million. The cost savings do not include substantially increasing service to all modes, reductions in maintenance expenses, decreased pollution and storm water runoff, providing a separate walk and bike facility from Parkway/Pine Street to Curis Lumber, and signficantly reduced costs from avoided crashes and serious injuries. The largest cost saving, not building Parkway from from Flynn Avenue to Lakeside Avenue, amounts to $13.0 million savings. Mini-roundabouts at $50,000 each replace $500,000 traffic signals at Pine/Maple and Pine/King intersections.